CURRENTLY READING Why I Still Watch "The Biggest Loser"
Why I Still Watch "The Biggest Loser"
Contributing writer and resident pop culture aficionado Lisa LaValle Overmyer, who currently works as a television producer and holds a Masters degree in TV, Radio, and Film from Syracuse University, takes a look at the health & fitness side of modern media. The views expressed herein are hers. It’s been over twelve seasons, more than seven years, and 181 episodes. There’s always a villain or two, obnoxious product placements to no end, and countless pounds lost (and occasionally gained). No matter how much I complain about the bloated episode length or the over-dramatic weigh-in music, I still tune in. But why? Why do I still watch The Biggest Loser? The short answer: Because if a 400-pound man can do jumping jacks, so can I. A little background on the show: The Biggest Loser is an elimination competition reality series that has aired on NBC for seven years and will probably continue until the end of time. The contestants aren’t just overweight— they’re usually all classified as obese, if not morbidly obese. For the duration of their time on the show, they live in a house together and are in the hands of professional trainers with 24/7 access to a fully-equipped gym. Each week, one contestant is voted off, and the goal is to lose the biggest percentage of their bodyweight in order to win $250,000 and have confetti fall all over them during the season finale. Seems all well and good, right? A show that highlights healthy eating and exercise as a strategy to lose weight. And yet, I definitely have a love/hate relationship with the show. First of all, like all reality shows, there are contestants who are there to “play the game.” These folks scheme and manipulate and form alliances in order to keep their place on the ranch, and it’s clear they’re not on the show simply to better their health— they want the cash. These “characters” certainly keep things interesting, but it can get to be a little much. While the show is styled to be inspirational, with its uplifting theme song and focus on stories of contestants’ previous struggles (everything from family tragedies to dashed hopes of professional athletic careers), how much inspiration can “real” overweight folks watching at home really get out of it? Of course the contestants are losing weight— they’re in the perfect scenario! They have elite trainers pushing them everyday, no job or family to answer to, no fast food joint tempting them on every commute. Given these ideal circumstances (and their high starting weights), it’s not unusual for multiple contestants to lose upwards of ten pounds a week, especially in the beginning of the season. Meanwhile, John Q. Viewer is sitting on his couch thinking he could never, ever lose weight like that, because he can’t afford a gym, works long hours, has three kids to take care of, etc. There’s an endless supply of real world reasons that ultimately make The Biggest Loser seem more like a fantasy than a so-called “reality show.” The series does follow up on eliminated contestants to show how they are continuing to lose weight while they are at home, but these packages are not nearly as in-depth as the action on the ranch. However, the ideal conditions at the ranch are short-lived. It’s not uncommon for many former Biggest Loser contestants to gain back some of the weight they lost on the ranch once the show is over, the most well-known instance being season 3 winner Eric Chopan, who gained back all but 30 of the 214 pounds he had lost to win the show. The extreme conditions at the ranch can’t be replicated in real life, and for some contestants, that’s a hard lesson to learn. Transitioning to a maintenance lifestyle while living their “normal” lives can be challenging. As a matter of fact, there’s been some controversy as to whether The Biggest Loser contestants are losing weight in a safe way. Contestants are often shown working out for hours on end, vomiting, or becoming dangerously short of breath. While there is constant medical supervision on the show, it can be tough to watch the contestants push themselves past their limits— are they trying to get healthy, or trying to win a cash prize? Which is more important to them in the long run? Personally, I’m not currently, nor have I ever been, obese. At any given time in my life, I’ve never really had more than 10 pounds to lose. I run half-marathons; I like vegetables. 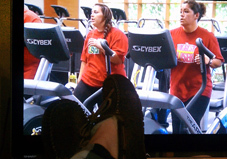 So what am I doing watching a show about extreme weight loss? But the real reason I keep coming back is, in fact, because of how inspirational the show is. When a contestant has a breakthrough, such as running their first mile without stopping, doing a circuit faster than they ever have before, or eking out one last sprint at 12.0 on the treadmill, that’s when the show is at its best. These people are doing things they never thought they could do, and often only weeks after living a life in which eating an entire pizza in one sitting was a regular occurrence. Even if the contestant’s accomplishment is something I could easily do, it’s still inspiring to me. It helps me realize that I don’t need Bob Harper or Jillian Michaels (Come back! The show needs you!) screaming in my face to push me to do one more rep or one more mile. So despite all the controversy and mild annoyances, I tune in every Tuesday night to get inspired. After all, if that 400-pound man can do jumping jacks, so can I! I think I’ll go do some right now. Is Your Partner Ruining Your Sleep?